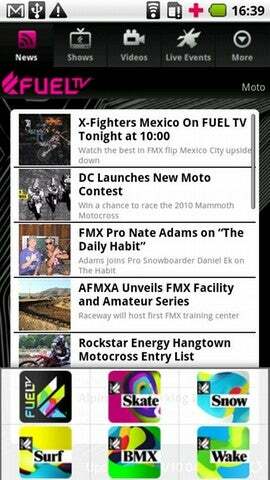 If you're into skateboarding, surfing, snowboarding, BMX, motocross, and/or wakeboarding, you probably already know what Fuel TV is, and you are probably psyched to see a Fuel TV app coming to Android. For those who don't know, Fuel TV is a cable and satellite TV specialty channel based in the U.S. that covers extreme sports such as those mentioned above. Programming features original series, exclusive events, licensed films, music, and more. The Fuel TV app for Android promises nine video channels, live event streaming, news, TV show info, PhotoBlog, ringtones/wallpapers, and more, which would be great--but it just doesn't deliver. As a surf fan, I know that Fuel broadcasts many live surf contests, and I was excited by the promise of being able to watch them on my phone while I'm out and about. No such luck. The live events on offer are so few and far between it's comical. The News section is also fairly lousy, with a small choice of stories, and those that make it are added a lot later than they should be. One of the things I was most excited about (apart from live events) was the videos section. This, again, was a major letdown. You get a handful of videos of the sport of your choice, and when you click one, you'll be greeted with grainy, low-resolution video that doesn't even utilize the whole screen (on a Motorola Droid, running Android 2.1). That's just silly. If you're only going to offer a few videos, why not make them look gorgeous? There is no "high quality" mode as in the YouTube app, and as a result, YouTube's video quality annihilates that of the Fuel TV app. Though I was very excited about this app, it's a nonstarter. While it is only version 1.0.0 now, when you're Fuel TV, people are going to expect much, much better. Hopefully Fuel will make some serious improvements. A flawed app that fails to deliver on its stated features: everything it does, it does very poorly.